At Old Chang Kee, they sell various concoctions of fried seafood (mostly shrimp & squids), fishballs, nuggets, chicken, heck almost anything that could be pierced by the bamboo sticks. They also specializes in curry puffs, this is not your average 3 by 1 half inch that we’re used to; it is more like the size a slice of cheesecake. There are also many fillings to choose from the traditional potato chicken curry, beef and sardines. 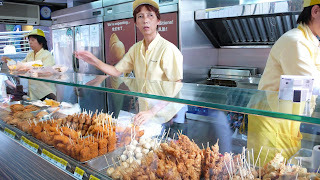 My personal favourites are the squid head on stick and the sardine puff (pictured). These two are exceptionally delicious; I’m producing access saliva while writing this. You might say that we also have Old Chang Kee in Malaysia (Sungei Wang & One Utama), but we don’t have that extra enhancer which is the sambal (fried chilli paste), and we also don’t have the sardine puff. If you don’t believe how delicious it is, just look at the number of people queuing up. If you’re ever heading over there, be sure to have a taste or feast! It won’t empty your wallet but filled your stomach instead. 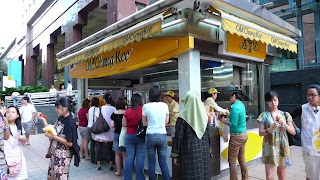 Old Chang Kee could be easily found on the Orchard Road stretch and throughout the island. i love pepper'o to the max! i don't know why old chang kee here doesn't serve sambal. beat the purpose of 'franchising'.